Easy to Carry – Lightweight and foldable design makes it very easy to carry. You can travel with it. Expand it, it’s a lantern; fold it, it’s a flashlight! No Worries on Power – You don’t need to worry about battery power! 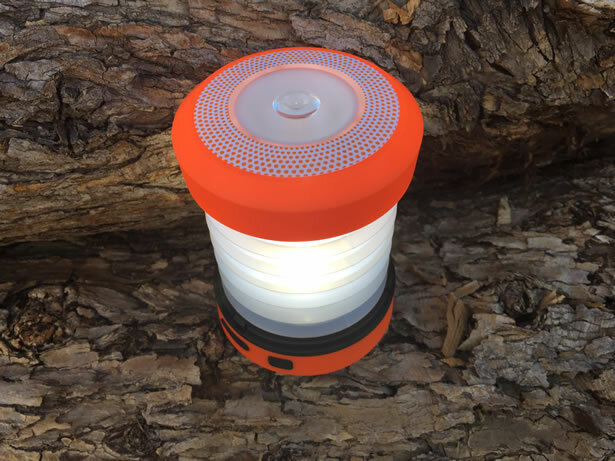 This lantern can be charged via USB and hand crank. Never be out of power! Two Brightness Levels – The USB flashlight as well as lantern has 2 brightness levels(High and Low), which is controlled by power button. And high mode is bright enough for reading and searching, the low mode is great to be a night lamp in your tent. Indoor and Outdoor – This USB lantern is perfect for indoor, outdoor and emergency use. It loves camping and hiking, just put it in your backpack, it won’t need much room. 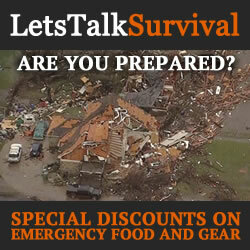 It’s prepared anytime you need it! ThorFire’s LED Camp Lantern is compact, lightweight and very portable at only 5.8 ounces. 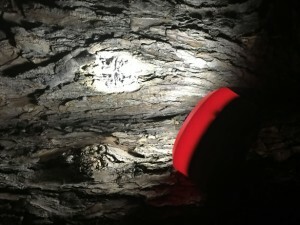 It is 3.30 inches in diameter, and a little over 1.75″ tall when it is fully collapsed so it looks very much like a short palm flashlight with a narrowly-focused beam. The center of the beam is further enhanced with a magnification lens. When the lantern is drawn out, the lantern is nearly 4.75 inches tall allowing the accordion-style light diffuser to spread the light in all directions. The lantern comes with a short USB to DC 3.5mm round-port charging cable, DC 3.5mm round-port to USB adapter cable, and a set of instructions. The body of the lantern is extremely durable and water-resistant. It is made from a rugged moulded ABS plastic that is bright orange and has black accents around it making it is easier to find when it falls to the bottom of your pack. On the base of the lantern, there are three non-slip rubber feet, a folding hand-crank, and a large collapsible loop for hanging up the lantern. The lantern is powered by a small rechargeable 300mAh 3.7V Lithium-Ion battery that can provide up to 30 lumen of light for as long as 4 hours in the power-saving low mode, and up to 125 lumen of light for as long as 40 minutes in high mode before stepping down into low mode where it will continue to shine for hours. The mode-select button is located on the side of the lantern. It cycles from off to low, then high, then off again. To the left of the mode select button is the 5V 3.5 mm charging port with a tethered rubber cover and a small LED light that glows red while the lantern is being charged. I think it would have been much better if the lantern’s charging port was micro-USB instead of the 5V 3.5 mm charging port as the cables are more commonly carried. The lantern also provides overcharge protection so that is one less thing to worry about. The folding hand-crank operates the internal 3-phase brushless DC generator that can provide a quick charge to battery when you don’t have power available. I found that turning the crank in either direction at a steadily at 2 revolutions per second provided the best results. Turning the hand-crank for 1 minute should generate enough power to provide about 4 minutes of light on high, and about 11 minutes of light on low. Additionally, the generator can be used to charge any USB-rechargeable device like a cell phone in an emergency with the provided cables. However, it could take quite a few minutes of spinning the hand-crank just to generate 1-2% of power so this feature should only be considered for extreme emergencies. ThorFire claims a 100% Satisfaction Guarantee, if there are any issues within 40 days of purchase they will either replace the product or refund your money. 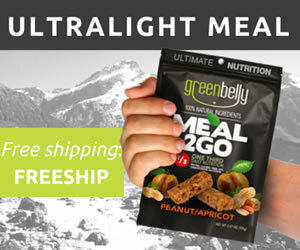 I could not find this on their site, but it is published on their Amazon product pages. 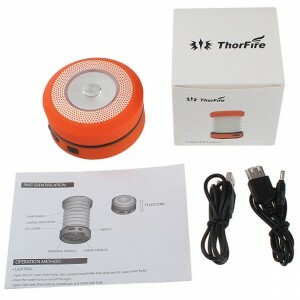 ThorFire’s LED Camp Lantern is a rugged light source that provides all of the features and functionality that matter. It is durable, lightweight, water-resistant, generates plenty of ambient light, and even provides its own backup power source. Ideal for campsites, backyard parties and emergency lighting solutions in and around the house when the power is out. Even though the LED Camp Lantern is a fine product, there is certainly room for improvement. For starters, a micro-USB port would be a far better choice than a 3.5 mm DC port and adapters. Second, the battery should be double or triple the size. At least enough power to provide light for one full evening or more. For a little less than $20, the LED Camp Lantern is a quality affordable gadget that provides a lot of value with its many possible uses. Founded in 2014, ThorFire has been specializing in design, development and manufacturing of attractive high-quality indoor and outdoor LED illumination products for use around the globe. Since its inception, ThorFire has launched several superior aluminum-alloy torch lights for outdoor enthusiasts, perfect for households, outdoor adventures, emergency rescue, etc.